so he let his mother do it for him. he stared into tidepools and aquariums. He even worked in a shop and kept a few octopuses himself. 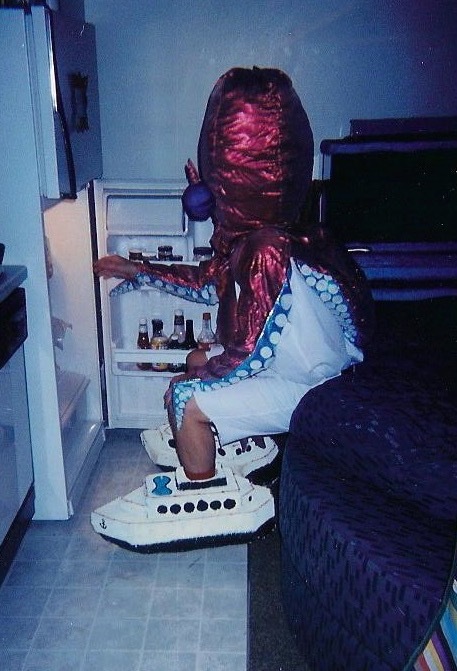 Not octopi, mind. Can't mix Greek and Latin. 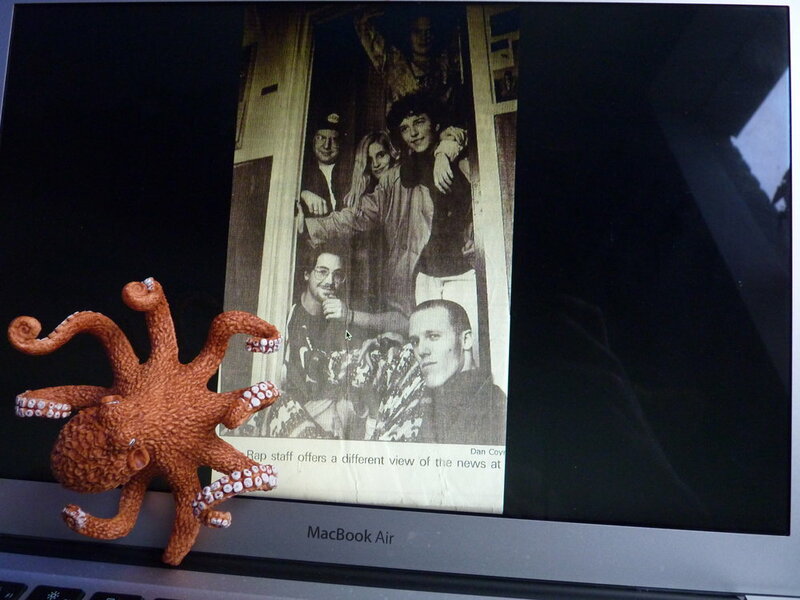 of journalists, helped to found The Fish Rap Live student newspaper (still going!) and decided to become a writer. Dress sense remained a major problem. 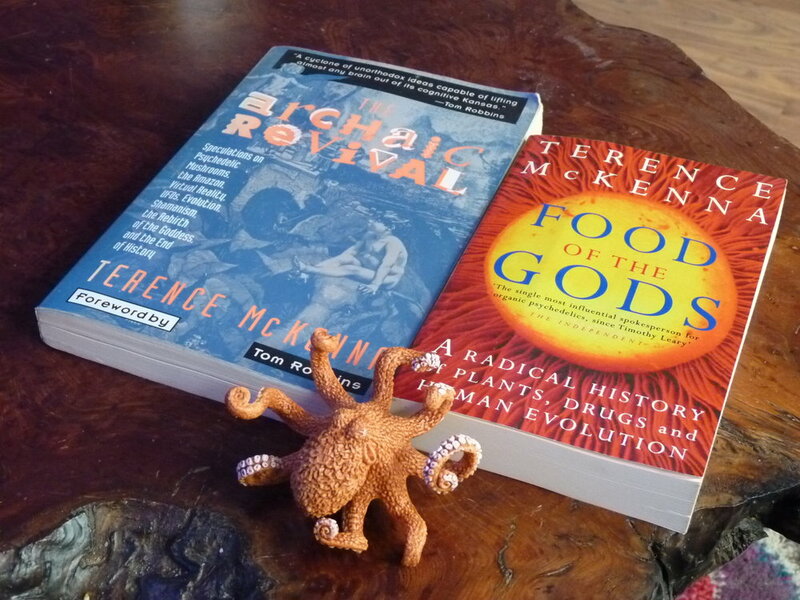 the octopus was introduced to the works of Terence McKenna. at the Esalen institute where Terence was the scholar in residence. This cost the octopus a bloody fortune and even still he had to chop onions and sleep on the floor of the conference room to make the nut. The octopus was teaching marine science to middle-schoolers at the time. What happened next became a book! As a spoken word artist, the octopus took himself very seriously. 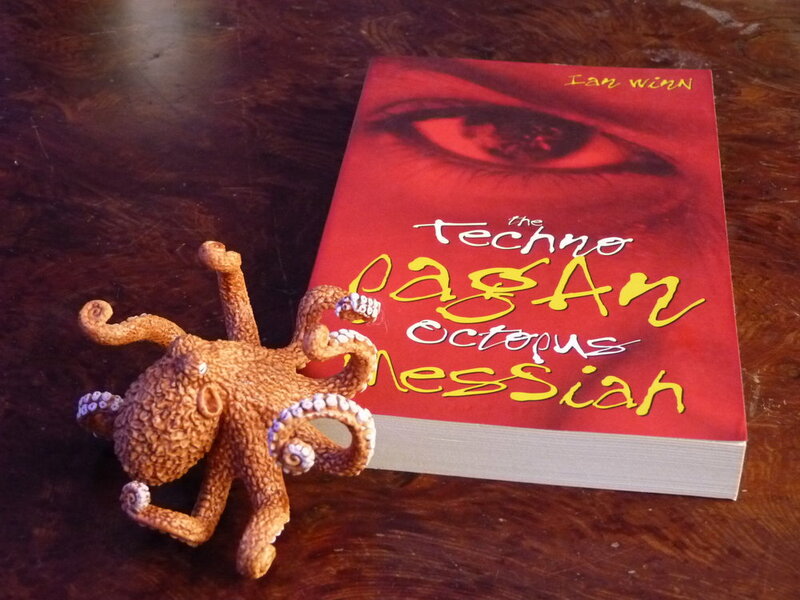 (despite it needing loads more work the octopus says now with 20/20 hindsight as he releases the 20th anniversary edition for its second coming in this, the Kaliyuga, the last of four great Hindu ages when "even the prophets cannot be heard above the fray"). where an embezzlement bankruptcy by their distributors meant the books never went to bookstores, media or many of his shows. Never saw America, really. The octopus had flamed out. He ended up in Denver, servicing aquariums and feeling very sorry for himself. This was before Colorado legalized weed even. Such terrible luck the octopus was having! On the plus side he was clearly dressing better. A slinky, tattooed, Englishwoman dropped a signed copy of TPOM off a canoe in Thailand and had to replace it for a mutual friend. She contacted the octopus via his website and, after an 18-month e-mail correspondence, no photos, no voice, long story short, they were accidentally married by a Sakalava crocodile shaman in Morondava, Madagascar in 2004 and legally so in California by two guys the octopus met way back at McKenna's fateful conference: Moorlock, who accompanied the octopus to Cairo as characterized/slandered in TPOM and the late, great Greg Junell who was just... an amazing human being. On the eve of a summer run of one-man-shows in San Francisco, the octopus had a psychotic break. He had been awake for three days trying to get from the antipodean points of Tulear, Madagascar to Oakland, CA while taking mefloquin to protect against malaria. Naked, covered in his own blood, he had his first-ever fistfight — in the street, against the Oakland PD — and was briefly institutionalized. He never even saw the theater and has been taking psychiatric medication ever since. (He is also very, very sorry for any harm/inconvenience he may have caused). Now the octopus is in a good place. Married to the woman he loves, with a wonderful dog, in his favorite city, in a beautiful home, with colorful friends from across the earth, with time to hone his craft and walk his path. Every day he meditates on gratitude. Well, almost every day. Some days he just does beer. Most importantly, his dress sense is now on point! Today the octopus and his bride live in a one-lair, reef aquarium in East London. Where, as a dual US/UK citizen, he has a special relationship with himself. That came out wrong. That's right mfers! 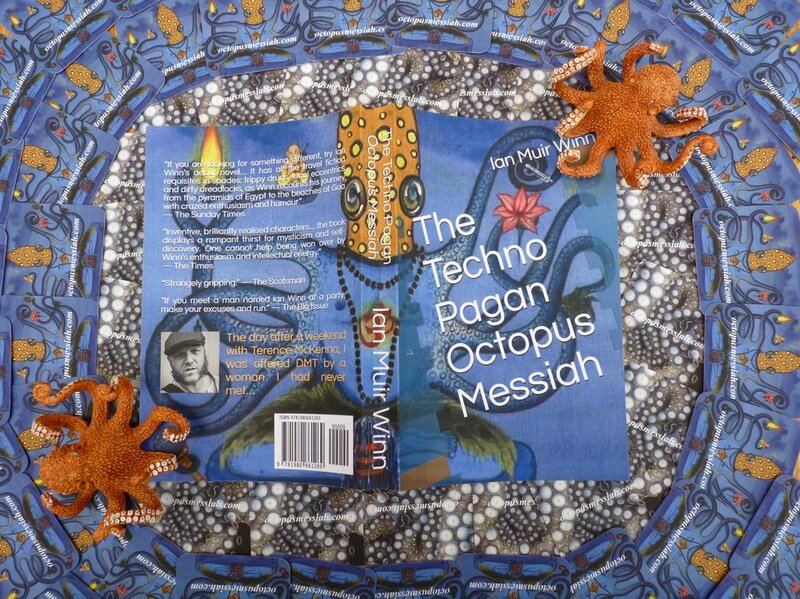 The 20th anniversary edition of the Techno Pagan Octopus messiah is now available digitally across the globe and in paperback in These Seven (Sadly not Eight) countries! it wasn't. Thankfully, he had help. He is very grateful to helpers. You know who you are. Most of you are in the acknowledgements section. he will land a lovely deal for his next book — or put up for sale on this same platform, don’t think he won’t. Currently seeking mutually rewarding collaboration so if you know someone who wants to put a book out and isn't another let-down merchant (OMG, the last guy), please do click the contact button above! No schmucks.